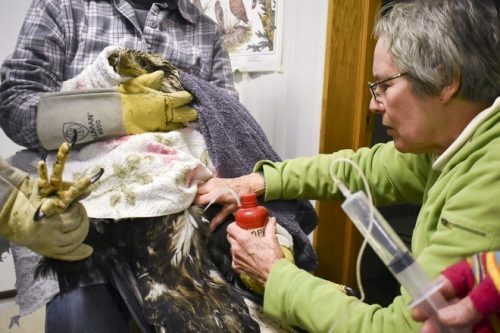 Fontenelle Forest is the only Nebraska organization with state and federal permits to treat raptors. This year, we are anticipating a 20% increase over the record 617 birds of prey we treated in 2017! Our work is supported entirely by donations from the public and a corps of volunteers that help throughout the state. 34 trained docent volunteers teach about the importance of raptors to our world. Our 89 transport volunteers answer calls at any hour and drive over 65,000 miles each year to recover or release raptors. For the first time, we will soon welcome a Bald Eagle who cannot be released back into the wild to join the 14 other non-releasable birds of prey on display in Raptor Woodland Refuge. Along with our education birds that travel the state, we reach over 117,000 people each year to inspire current and future generations to care for the natural world. With your gift today, you are ensuring our region’s raptors are cared for.